LARGE WORK PLATFORM: Includes 30 in (76.2 cm) slideout deck extension for extra supplies and work space, extension is supported mid-rail to eliminate jams. COUNTER ROATATING WHEELS: Will not cause carpet to buckle, helps protect sensitive floors and prevent surface scuffs on job site. 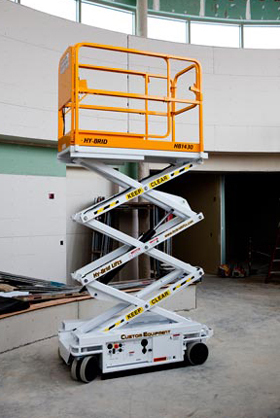 LOW STOWED HEIGHT: Low entry height allows for easy loading of materials and tools onto the platform. LOW FLOOR LOADING: Extremely lightweight design allows fo use on delicate or sensitive surfaces. USER-FRIENDLY DESIGN: Low step height and full swing gate provide easy access to platform and reduce chances of knee and neck strain. ROBUST RAIL SYSTEM: Unique rail technology provides greater durability and resilience against wear on the job site. OVERSIZED 1.25 IN (3.18 CM) PINS: Robust scissor stack requires no greasing and oversized pins reduce scissor sway. NON-MARKING WHEELS: Protect sensitive floors and prevent surface scuffs on job site. NON-SKID DECK: Large durable platform provides safe and ample working area. BUILT IN TOOL TRAY: Keeps tools and supplies organized and within reach. DUAL USB PORT: Allows users ability to charge mobile divices directly from platform.